Director John Moore took a different approach to the franchise and gave it a heavy dose of the Michael Bay treatment. Now, I’ll be the first to say that I am no fan of Bay, but say what you will about the guy, he can film an action sequence and blow things up like no other. The only movie I enjoyed from Moore was his first film, ‘Behind Enemy Lines‘, which starred Owen Wilson and Gene Hackman. His later films such as ‘Max Payne‘ and the remake of ‘The Omen‘ proved to be poor choices for him. This 5th ‘Die Hard‘ is wittier and more adventurous, much like ‘Behind Enemy Lines‘ was, which made this installment much more fun. Moore went with the approach that he wouldn’t mess about with character development or story lines, but rather start with the action bright and early and never let up. And from the 4th film of the franchise being as horrible as it was, I think we needed something like this to make us fall in love with this character all over again. And let me put your minds at ease, this film is rated ‘R’, unlike the last one, which was made for pre-teens and rated PG-13. Here you will get some great kill-shots, a few dozen gallons of blood, and that famous line of his yelled loud and clear. So, a few years have passed and McClane hasn’t seen his son (Jai Courtney) in many years, and he thinks he is mixed up with the wrong people when a fellow police detective informs him that his son is mixed up in some very nasty business in Russia. 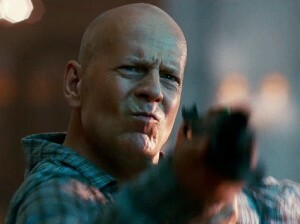 As fast as you can say “Yippee Kay Yay”, McClane is on a plane to Russia to re-connect with his son and take him home. Meanwhile, his son Jack looks to be in cahoots with some very bad criminals in which he is caught and on trial in Russia. As you can imagine, one explosion leads to another and Jack escapes and takes his partner in crime with him to getaway from the people who are trying to kill them. This leads to a car chase sequence that might be in my top five car chases in cinema history. I haven’t had this much fun with a car chase since ‘Bad Boys 2‘. Low and behold, during the car chase, Papa McClane shows up and saves the day, but not without destroying 80% of Russian in the process. McClane sees that his son has been working for the CIA as a spy for a number of years and the criminal he has in tow has some key evidence that would unleash some horrific material on some very powerful people in Russia. From here, we move through several shoot-outs, more explosions, till we end up in actual Chernobyl, where there is some serious stuff going down and a few of our characters have a few twists of their own. And our climactic fight scene seems very familiar for fans of the past films, which made me giddy, as it made me think I was back in 1988 again. I really enjoyed the banter between father and son here. It never seemed forced or silly. It seemed sincere and at times was very funny, as some of the dialogue in the past has been with these films. The comedic timing was perfect. The hand-to-hand combat packed a punch and proved that Willis still has what it takes to fight man to man as well as take any sized gun and use it with ease. Never at one point did I think he was too old of this sh*t. Courtney proved to be a badass here as well, as he was in ‘Spartacus‘ and ‘Jack Reacher‘. Him and Willis had great chemistry together. And of course the action sequences were top notch. It’s as if Moore went to Michael Bay training school and graduated 1st in his class, minus the super quick cuts, which made the viewing experience much better and the action more intense. Despite its unintelligent story plot and predictability, ‘A Good Day to Die Hard‘ made me excited for the 6th film, which subsequently is already in the planning stages. Willis has proved he is still up for a good fight with plenty more bad guys to kill. Packed with some good references to the previous films as well as some funny moments and high-octane thrills, I can’t wait to watch this again and have fun with it. 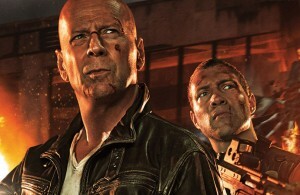 ‘Die Hard 5’ Set for a 2013 Release and Gets a New Title!!! This entry was posted on Wednesday, February 13th, 2013 at 12:35 am	and is filed under Film, News. You can follow any responses to this entry through the RSS 2.0 feed. You can skip to the end and leave a response. Pinging is currently not allowed. « Josh Holloway Set To Star in New TV Series ‘Intelligence for CBS!! !